Marc Schwartz has played Guitar since 1968. His diverse influences include: Bireli Lagrene, Wes Montgomery, John Lennon, Django Reinhardt, Joe Pass, Eric Clapton, Larry Coryell, Pat Martino and Jimi Hendrix. An East Coast native, Marc has lived in California off and on since 1975. His jazz Guitars include several very cool Archtops including a 1948 D’Angelico and a 1937 D’Angelico. Marc has performed live with Larry Coryell, Bruce Forman, Mimi Fox, Howard Alden, Andreas Oberg, Dan Robbins, Tony Green, Ginny Mitchell, Paul Mehling, Patti Maxine, Ninine Garcia, Ned Boynton and many others. 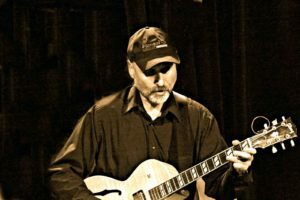 Marc holds a degree in music from New York University and has studied with Studio/Jazz guitar greats Allen Hanlon and Milt Norman. When not playing with Hot Club Pacific, his Santa Cruz, California based Swing band, Marc can be found playing jazz guitar in various Northern California venues, hiking in the Santa Cruz mountains or riding one of his classic Harley-Davidson motorcycles along California’s legendary Highway One.